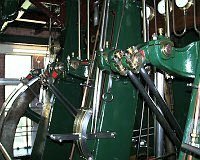 The engines are mirror image twins, being a left hand and a right hand pair exactly opposite each other in line, and are unique in having Corliss trip valve gear driven by eccentrics. Each engine weighs 404 tons and stands some 55 ft. high on a footprint of approx. 36 ft. long by 15 ft. wide. They are located in line. Although tested to run at 150 lbs. /sq. in when built, Victoria is now run at around 130 lb./sq. in, and at 24 rpm when working on open days.Although both engines survive, only Victoria, is now in fully restored working condition. The reconstruction and repair of Victoria in 1991-1996 sought to ensure as authentic a return to the original construction as was practical, and this has been achieved successfully by Mr Crane. Many individual parts were made in replica by him and his team to ensure this authenticity, using parts and damaged components retrieved from both Victoria and Alexandra as patterns. The second, mirror image paired engine “Alexandra” is still in situ but minus many fittings. It is nevertheless presented in an integrated and compatible way, painted in distinguishing red oxide colours, still maintaining the shape, construction and mass of the original. A complete description of the original steam engines and pumps and associated equipment is available in the Friends’ records.